One out of every three middle-aged American suffers from vein disease. Many people are unaware that they suffer from vein disease. Although vein disease symptoms may not seem harmful – at least not at the beginning - it can potentially form into more serous problems if left untreated. Thanks to early detection, patients can avoid potentially dangerous health repercussions. There are a variety of reasons why a person suffers from vein disease. One of the most common causes is heredity. Other causes include weight gain, pregnancy, birth control, etc. Age, obesity and jobs where long periods of standing are required also contribute to vein disease. Veins are blood vessels that carry blood to the heart from the body. Veins are made up of one way valves inside them. When these valves open, they allow blood to flow to the heart. 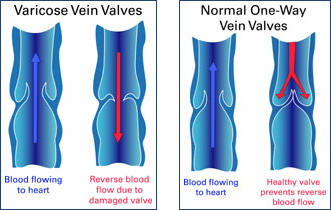 The valves close in order to prevent blood from flowing back to the body. Vein disease occurs when the one-way valves (located inside veins) fail to close properly. Problems occur when blood begins pooling in the vein. This can cause a host of vein problems. What are the types of vein disease? Varicose veins and spider veins are the most common forms of vein disease. Varicose veins are described as the large, robe-like veins that that can cause pain and other problems if left untreated. Spider veins are the small purple/blue veins that are noticeable on the surface of the skin. Spider veins can also be painful. This vein condition is described as enlarged deep blue veins that are raised above the skin’s surface. Usually, varicose veins are a symptom directly associated with a condition known as venous insufficiency. Varicose veins normally take a few years before a person starts noticing signs and symptoms. This type of condition is usually inherited. If varicose veins are left untreated, it can actually trigger problems with the skin’s surface and cause venous leg ulcers. Spider veins, also referred to as ‘telangiectasias’, are described as small veins just under the skin’s surface. This sort of vein condition is reminiscent of the shape of a spider web. Spider veins are normally blue or red in color and they form in various sizes. These unsightly veins can be found in various parts of the body such as the legs, ankles, calves, thighs and even on the face. In addition, if you stand for long periods of time, this can add pressure to your leg veins and cause spider veins. People who wear tight under-garments such as support girdles, tend to develop spider veins. Spider veins are more common in women than men because of hormonal changes to the body. Spider veins, just like varicose veins are very common between the ages of 30-70. The first obvious sign is the appearance of a spider web, as mentioned previously. Some people experience the feeling of heaviness in their legs accompanied with an achy and fatigue feeling. You may also experience a burning and throbbing sensation within your lower legs. Muscle cramping is another symptom of spider veins. Another symptom is referred to as ‘stasis pigmentation’ -- this is when the skin color changes. If left untreated, it can lead to inflammation of the skin and even open sores and bleeding. How do you know if you have vein disease? Vein disease can usually be seen by looking at the color and size of the vein close to the skin’s surface. Sometimes, vein disease is not easily visible to the eye. During your physical exam, Dr. Doshi will determine whether or not you have vein disease. What age do people tend to get vein disease? There have been instances where people have experienced vein disease as early as 35 years old. The most common age is over the age of 50. What can happen if vein disease isn't treated? If your varicose veins or spider veins are left untreated, this will only cause the pain to increase. It may also greatly affect your walking and cause cramping within the legs while sleeping. When varicose veins are not treated, this can cause tissue loss, open sores and even blood clots. How do you get vein disease? One of the most common causes of vein disease is heredity. Age, obesity and jobs that require an employee to stand for a long time can increase one’s chances of vein disease. Pregnancy can also increase the chances of vein disease. What type of people should not be treated? If you are pregnant, you should wait at least 3 months before having vein treatment. If you have deep vein thrombosis or a suppressed immune system, you should avoid vein treatment. Are there any complications of vein treatment? Sclerotherapy and Endovenous laser therapy have rarely been associated with any serious complications when properly performed. Some patients experience very minor complications such as tenderness, mild itching and light bruising. This usually lasts for up to 2 weeks following treatment. Currently, there aren’t any methods that prevent vein disease. However, there are a few steps you can take to help reduce or slow down the progression of your symptoms. For instance, maintaining a healthy weight and exercising regularly can help improve your legs blood circulation. You may also want to eat a healthy, high-fiber and low-salt diet. Often times, extra weight can cause added pressure within the legs and cause swelling. Make sure you wear comfortable shoes to prevent unnecessary pressure within your legs. Avoid standing or sitting for long periods of time. Try shifting your position throughout the course of the day to help improve blood flow. The general rule of thumb is to move around every 30 minutes. One of the first symptoms of vein disease is the feeling of heaviness in the legs and fatigue. Leg pain accompanied with unattractive varicose veins can actually lead to blood clots and even thrombosis. Thrombosis happens when a blood clot develops because of a chronic venous blood congestion. A life-threatening pulmonary embolism can result if the blood clot travels from the leg to the lungs. It can also cause discoloration of the skin on the lower legs and leg ulcers, which are extremely difficult to heal. Compression Stockings For minor pain from varicose veins, compression stockings may be beneficial. Basically, they assist the leg in pumping blood back toward the heart. Compression stockings alone can help relieve symptoms, but they won’t make the varicose vein go away. Sclerotherapy Used commonly for spider veins and small varicose veins, sclerotherapy involves injecting a small amount of a solution (a sclerosing agent) directly into the diseased vein. The sclerosing agent damages the lining of the vein and causes it to seal shut. This completely gets rid of the diseased vein. Sclerotherapy is performed quickly right in a doctor’s office with no anesthesia. Surgical Stripping Historically, the only treatment for large varicose veins was to surgically remove, or ”strip,” the vein from the body. Surgical stripping is done in an operating room under anesthesia and requires significant time to recover. More recently, a modified version of stripping known as ambulatory phlebectomy has become more popular. During this procedure, multiple incisions are made to hook and remove the vein, one portion at a time. More incisions are made than with conventional vein stripping, but it minimizes damage to the leg and reduces the time needed to recover. Endovenous Laser Therapy In the past few years, the use of lasers has become an accepted alternative to surgical stripping for the treatment of varicose veins. During endovenous laser therapy, a thin laser fiber is inserted into the diseased vein, generally through a small puncture in the skin above the affected area. Next, the physician uses an electronic device to deliver laser energy through the fiber. As the fiber is gradually removed from the vein, this energy causes the vein to collapse and close off blood flow. Endovenous laser therapy can be done right in a doctor’s office in less than 1 hour. Also, the procedure is minimally invasive, so the patient is encouraged to walk immediately afterward. Early detection and consultation with our physician will help improve your leg health. We offer our patients a variety of treatment options to help them lead a painless and active lifestyle. To schedule for a consultation call us at 847-605-9500. If you prefer to use our website to schedule a consultation, please click here. My Doctor recommended that I go see Dr. Doshi after I had complained about my varicose veins and the pain they caused. Dr. Doshi and his staff were wonderful.